Eatonton, GA, September 13, 2013 – Lynward Lindsey, Board Chairman announced that Terry Schwindler has been appointed Economic Development Director of the Putnam Development Authority in Eatonton, Georgia. 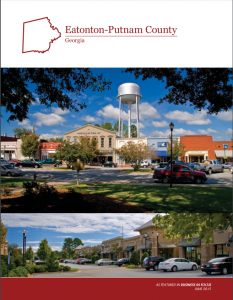 Terry will manage the Marketing/Attraction and Business Retention/Expansion Program focusing on developing relationships with local, regional, and statewide economic development agencies, prospect companies, site selectors, consultants and existing industry in Putnam County. Her primary goals include creating new jobs, retaining existing jobs, and generating new investment in Putnam County. Schwindler was the Manager of Business and Industry for the Macon Economic Development Commission since January 2012. Prior to that, she spent over 7 years with Infinity Network Solutions in the IT Industry. Terry is a member of several professional organizations in the economic development field such as: the Georgia Economic Development Association (GEDA), Middle Georgia Economic Alliance (MGEA), Southern Economic Development Council (SEDC), International Economic Development Council (IEDC), and the Georgia Employers’ Association. She and her husband, Paul Schwindler III, have a fourteen year old son, Paul Schwindler IV.